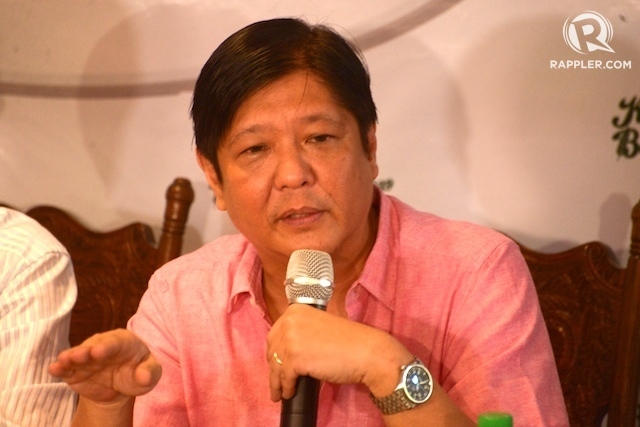 →41 YEARS AFTER MARTIAL LAW | Should Bongbong Marcos bear the sins of his father? MANILA – Should Senator Ferdinand Marcos Jr. bear the sins of his dictator father and namesake? The younger Marcos was 15 years old when his father imposed military rule throughout the country. He was 29 when EDSA People Power ousted them from power. “I don’t think that the sins of the father should automatically pass on to the son, except that there is no acknowledgment of the truth, of history, much less remorse. Acknowledgment nga wala, remorse pa, not of the part he played because he was very young then, but the part played by his father, his family, his family’s friends, those we called cronies,” said Lidy Nacpil, widow of assassinated student leader Leandro Alejandro. Not acknowledging is “very dangerous,” Nacpil said at a forum commemorating the 41st year of the declaration of Martial Law, held at the University of the Philippines’ College of Social Sciences and Philosophy. What if he runs for president in 2016? A political analyst said that the senator’s chances of becoming the second Marcos president of the republic are good. The potential votes he supposedly can realistically court: as many as 5 million votes from Iglesia ni Cristo, 4.5 million from the Solid North, and 1.5 million from Marcos loyalists, all for starters. The rest of the 15 million needed to elect a president, the senator will presumably have to work on from Visayas and Mindanao. Lawyer Raffy Aquino, who was a student activist from the late 70s to 80s, said that while he doesn’t see a deliberate attempt from the Marcos family to revise history to put them in a more favorable light, Filipinos should remember that Bongbong’s being in Senate – “a training ground for presidents” – means he is within striking distance of the presidency. Nacpil believes there is in fact a “deliberate, consistent” use of relics from the Marcos era to romanticize the father’s rule. She says there is a “subliminal” use of the colors (red, blue, and yellow) of the older Marcos’ Kilusang Bagong Lipunan (KBL) party in the younger Marcos’ social media assets and the use of the word “oligarchy” in the senator’s pronouncements. “There’s consistency in his attack against corruption and the oligarchy or the wealthy elite. Remember that [the late] Marcos justified his takeover of businesses during his dictatorship as a fight against the oligarchies, like the Lopezes. I see a repeat [of the messages] here,” Nacpil said. “I can’t believe that (he will be the second Marcos to become president). It’s more possible he became senator because they have a lot of money, but heaven forbid that he will win as president,” Nacpil said in a mix of English and Filipino. Aquino agreed. “Kalaban natin ang limot, ang paglipas ng panahon (The enemy is forgetting, the passage of time,)” he said. Whatever space in memory is left for the younger Marcos is used to attempt to reinvent and market himself as a possible head of the republic, he said. “There’s a lot that we need to do to remind people about that part of our history,” said Nacpil, lauding the UP CSSP and its Department of History for organizing events and programs to teach the younger generations about Marcos and Martial Law. More than that, Bernadette Abrera, head of the UP history department, said memory must be institutionalized – in the academe and in law, for instance. Abrera dared the students who attended the forum to have a deeper appreciation and understanding of history. “History is alive in our hands,” she said. “I think that’s the better question to mull,” he said.